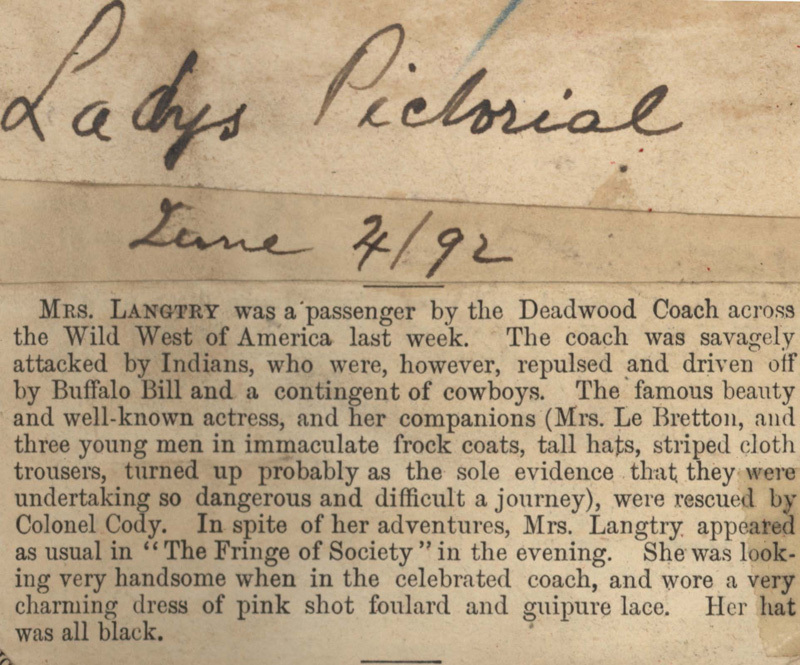 MRS. LANGTRY was a passenger by the Deadwood Coach across the Wild West of America last week. The coach was savagely attacked by Indians, who were, however, repulsed and driven off by Buffalo Bill and a contingent of cowboys. The famous beauty and well-known actress, and her companions (Mrs. Le Bretton, and three young men in immaculate frock coats, tall hats, striped cloth trousers, turned up probably as the sole evidence that they were undertaking so dangerous and difficult a journey), were rescued by Colonel Cody. 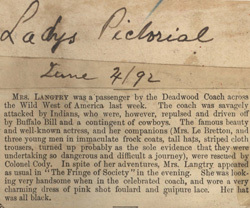 In spite of her adventures, Mrs. Langtry appeared as usual in "The Fringe of Society" in the evening. She was looking very handsome when in the celebrated coach, and wore a very charming dress of pink shot foulard and guipure lace. Her hat was all black.